Hatching your own birds eggs will give better results than shipped eggs. ü IdIdeally, chicks do better incubated by a hen. By incubating at home, you are trying to replicate what Mother Nature does. Hens rotate eggs maybe 24 times a day. They lose belly feathers before incubating leaving skin contact for the eggs creating humidity & steady body temperature. ü G Get your incubator running and up to temp (99-100 degrees) the day the eggs arrive; fill reservoir with water per incubator instructions. I use automatic turner so I don’t have to open incub often losing heat & humidity. Be aware setting eggs is very different depending on your climate. For example it’s different in high, dry Colorado versus sea level, humid Florida. I sometimes use the wire cage for staggered hatches to protect hatchlings from falling under the turner. ü C Check the aircells in eggs and for any cracks. The USPS is very hard on eggs in boxes. The shaking in shipping can create “bubbly” air cells which usually will not support an embryo. Neither will eggs with cracks as these eggs lose ability to support an embryo. ü I tBreeders typically send clean eggs but some may have dirt smears; I wouldn’t suggest washing. Unwashed eggs have better chance of hatching…think about what goes on under the hen in nature. The eggs get dirty. Set eggs in incubator once temp has stabilized, narrow end down in turner. Colorado is high & dry so I increase water in the reservoir above & beyond the instructions to 50-60% humidity during incubating & as high as 75% at hatch. Due to high elevation, I take out the plugs from the start of incubating for better air circulation. ü C Candle eggs after day 7. I use a Cool Lume but you can use a flashlight briefly. A hot light & handling stresses the embryos so keep candling to a minimum. Candle in completely dark room. Look for a small blob with veins, like a spider with red legs which is a healthy, growing embryo. If the egg is “clear”—no veins—then it wasn’t fertile or died early on. Discard it or any rotten smelling eggs. A blood ring indicates a dead embryo. Be careful with brown eggs as they are very difficult to see the embryo. Its heartbreaking to discard a live embryo ….candle again at 14 days to see a moving embryo or just wait & see if they hatch. · Its best if the chick peeps thru the shell on its own and zips out on its own. This means a healthy strong chick beginning life. After a chick peeps thru the shell, they should be out completely within 12 hours. Sometimes if humidity is low, they can stick to the membrane. I may spray warm water on eggs to loosen the membrane. If at end of 12 hrs from tenting the shell, if they are alive & peeping… I’ll carefully peel back shell & membrane around the beak. Stop if any bleeding in the membrane. This usually means a weak chick and is often not successful. · On 22rd day with no peeping, the chicks are probably dead in shell. You can break open one to check. I may shake the egg slightly to see if I hear peeping. I start my babies on Manna Pro 26% protein chick crumble for 2 weeks. They also receive liquid baby electrolytes in their water the first week. If they are strong and a hen is caring for them, I let them out with her in the yard about the 3rd day. I separate her from the other birds to avoid squabbles. If no hen, at about 2 weeks I let the babies out in a secure pen, supervised & with shade/sun available. It means moving them back & forth but they do well with some outside time. BEWARE of using shavings for bedding. I no longer use shavings except in the adult coop as chicks ate shavings and died. 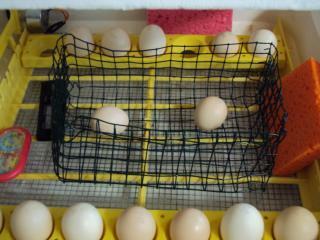 As I hatch small numbers of eggs, I put paper towels down in a large plastic storage bin for baby chicks. After a week or so, when they are well established on chick feed...I use bedding made from recycled newspapers. Its a gray color sometimes as pellets or sometimes softer looser pieces. Its a kind used for small animals at Petco or Petsmart and has odor absorbing capability. Shavings tended to get smelly quick! BEWARE of using wood pellets as well. When the pellets get wet, they disintegrate and look almost the same as chick crumble. Educate yourself about chickens, chicks, incubating and hatching from many sources. Check web pages of 4-H groups, agricultural colleges (Mississippi has a good poultry one), BackYard Chickens, Feathersite, etc. Also go to the local library or talk to poultry hobbyists in your area. Some areas have poultry swaps, but buyer beware at a swap. Keep in mind the possibility of disease or disfigurement.